Properties in Specchiolla average 4.7 out of 5 stars. Villa for private garden groups 200 meters from the beaches. Up to 8 p. bed. Property 13: Villa for private garden groups 200 meters from the beaches. Up to 8 p. bed. 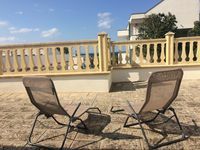 Ostuni sea view house - 200 mt sandy beach - PRIVATE BEACH INCLUDED! Property 18: Ostuni sea view house - 200 mt sandy beach - PRIVATE BEACH INCLUDED! Newly built house for rent in Apulia, 50mt from the sea. See now! Property 19: Newly built house for rent in Apulia, 50mt from the sea. See now! Two-room apartment near the sea! Property 28: Two-room apartment near the sea! The house is in a lovely spot with sea views. We bought fish in the morning by walking across the street. In late September, most cafes and shops had closed for the season, although a few of the beachside places opened at the weekend when the weather was still very warm. Nice spots nearby to travel too - Santa Sabina, Ostuni, Torre Guaceto, Alberobello, Cisternina. With a car, a good base to visit the area. A beautiful home and a super gracious host! We truly enjoyed our stay here! Filomena was very communicative from start to finish. When we arrived the home was inviting, very clean and had all essentials for a 5 day stay. There is parking conviently available on site which if you are staying in Puglia renting a car is pretty much a must. The location is great as well since it's 20 minutes to some major attractions. We're a couple so it was more space than we needed but great for a family. We throughly enjoyed our stay here and highly recommend this flat! Thank you Filomena! !